Food Fail | Discovering My Heart! That was the first false alarm, but my contractions continued well into Saturday evening – and I don’t just mean a few here and there, I mean constant contractions that were 3 to 5 minutes apart. I was in and out of the hospital more times than I care to remember. I know most of the nurses thought I was crazy, but when they saw contractions registering then they shut up! However, there wasn’t enough going on to keep me, so home I went. Now it still tasted amazing, but it just wasn’t as pretty as I would have liked. I want to blame this on Cooper, like I do everything else, however this one was all the baby brain. I just forgot they were in the oven! And honestly they are only in there for a few minutes! I was using Facetime to talk with my nieces and nephews and showing them Cooper’s new trick (Which is just sitting pretty, but he does it so well), and then the smoke alarms went off! I alerted the whole apartment complex to my food blunder! Anyway the recipe is still a good one if you don’t have a bonfire to go to, so here it is just for fun. Set your oven to Broil on high, however if you have baby brain like me I recommend low. In your cast iron skillet melt the butter. 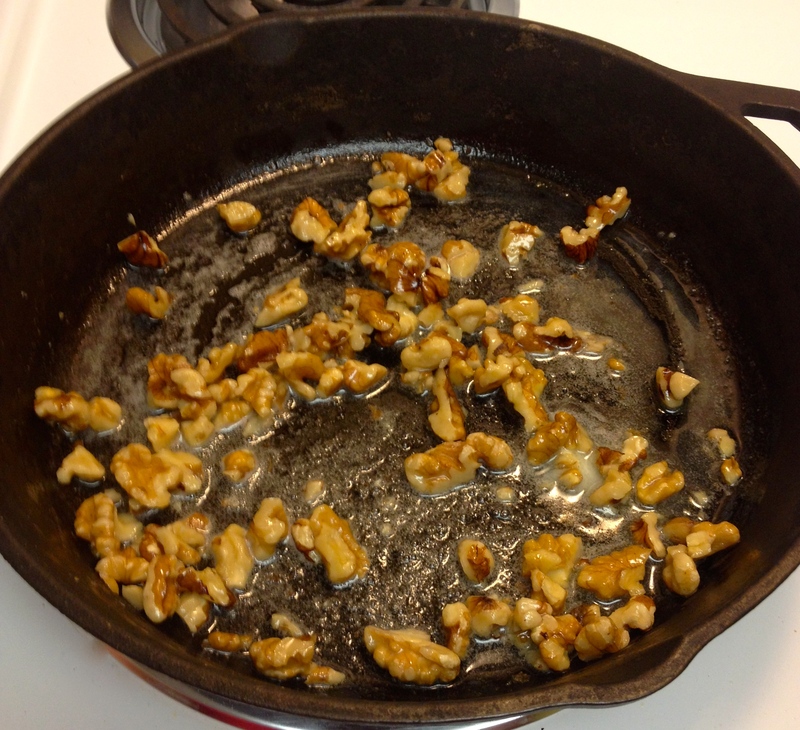 Once melted, add in chopped walnuts until they are toasted and fragrant. 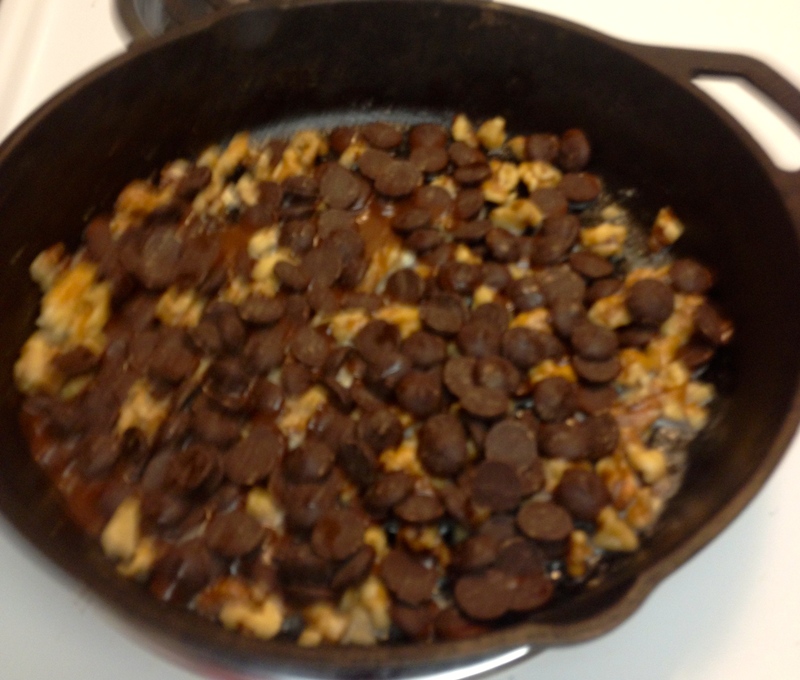 Remove from the heat and add the chocolate chips. They will begin to melt right away, just let them be, I know that is the hard part. 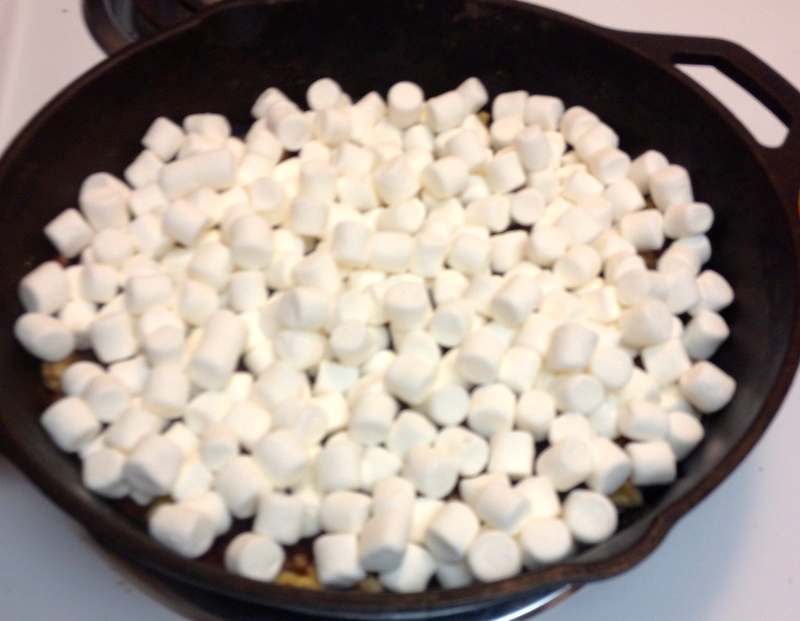 Then top the chocolate with all of your marshmallows. mine…remove from the broiler and break off some of your graham crackers and enjoy! NOTE: Another way to make this is to line a sheet pan with graham crackers and then place a chocolate bar on top with the marshmallow and then broil. Once the chocolate is melted and the marshmallow toasted, top with another graham cracker. PREGNANCY UPDATE: Also, I know I keep saying I am going to post a picture of the baby’s nursery, but honestly as soon as I get something done, someone comes in and messes it up – like my mother who just has to leave all of her suitcases in the room for a few weeks! I know my little guy will be making an appearance in the next few days – I just have a feeling, so you will all get to see the nursery and the baby very soon!